Product Dimensions (L x W x H): 22" x 17" x 5.5"
Our Cutty Sark model is scratched built plank on frame and strip by strip of exotic wood put together. It is completely hand built by skillful and creative master craftsmen; you will be amazed at how real it looks. The hull is truly beautiful, combined with skills and pure wood, the hull is smoothening out equally giving a shiny and silky feel on side of the hull. On the ship, you can easily locate stunning wooden details such as: 3 wooden booms, 1 wooden bunker, 4 front and 1 main masts with fabric sails and detailed stitching, all rigging are matching colors, 4 wooden boats, 2 wooden storage room, 2 metal fences on the front and back of the ship, 2 metal ornaments embedded with Cutty Sark locating in the back and front left of the ship, 2 metal anchors, 1 metal statue in front of the ship, and many more. We absolutely use no plastic parts only the highest quality wood and metal. Our model was built according to scale through original plans, pictures and drawings. Attached to this model is a wooden stand with a metal name plate embedded Cutty Sark 1869. 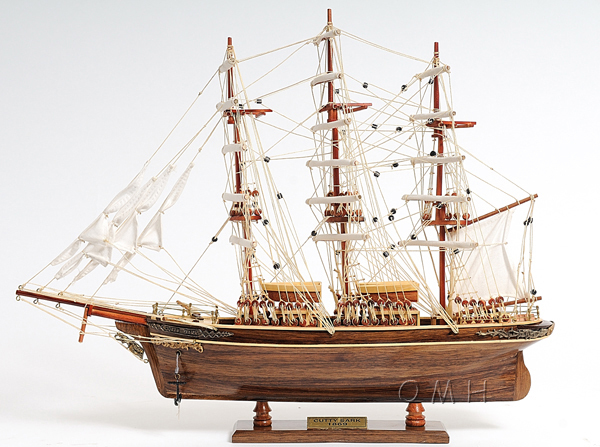 This model is being ship inside a secure wooden crate; it comes fully-assembled and ready to be display.